In this photo taken Oct. 8, 2010, the U.S. Supreme Court justices pose for a group photo at the Supreme Court in Washington. The blockbuster final week of the latest Supreme Court term delivered rulings across the ideological spectrum: The justices extended benefits to gay spouses, upended the Voting Rights Act and preserved affirmative action in college admissions, at least for now. But as legal scholars take a step back and examine the term in full, they say the court leaned unmistakably to the right — and came down consistently on the side of big business. The justices made it more difficult to bring class-action suits against companies, raised the bar for workers to win discrimination claims and protected pharmaceutical companies against people who say they were harmed by defective generic drugs. “This is a court that is making life easier for business,” said Stephen Wermiel, who teaches constitutional law and a seminar on the Supreme Court at American University in Washington, D.C. The rightward shift follows a pattern set by Chief Justice John Roberts, who was appointed in 2005 by President George W. Bush and who, at the relatively young age of 58, is likely to lead the court for a generation. There have been high-profile exceptions, like the court’s decision to strike down the Defense of Marriage Act, the 1996 law that blocked federal recognition of gay marriages authorized by states. But in general, the Roberts court has aggressively moved the law in a conservative direction on questions of business, politics and access to the courts, said Tom Goldstein, the publisher of SCOTUSblog and a Supreme Court analyst for NBC News. 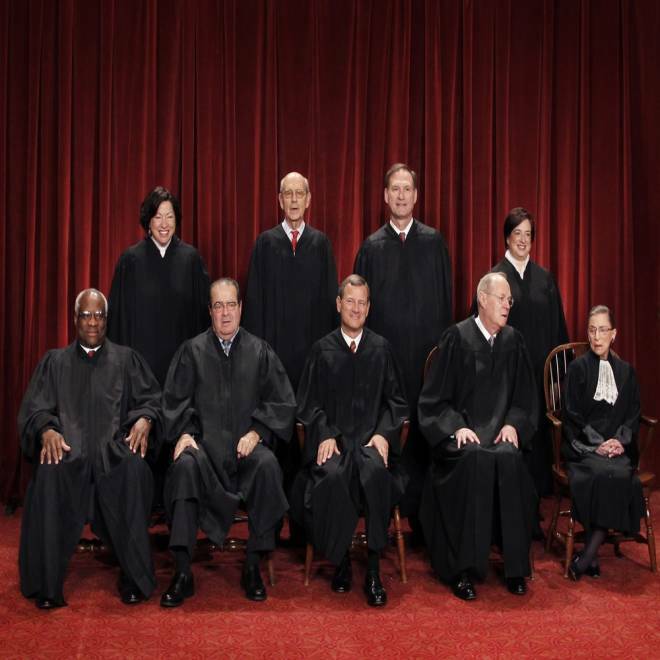 A review of Supreme Court decisions in the 2012-2013 term shows win after win for big business. The court sided with American Express in a dispute with restaurants and retail stores. The merchants wanted to pursue a class-action antitrust case, arguing that AmEx was leveraging monopoly power to charge inflated fees. The justices said the merchants were bound by an arbitration agreement with American Express and had to pursue their claims individually that way, even if it was more expensive. “The antitrust laws do not guarantee an affordable procedural path to the vindication of every claim,” Justice Antonin Scalia wrote in his majority opinion. In another antitrust case, the justices ruled in favor of Comcast, the parent company of NBC News, and against a group of cable subscribers who said they were being overcharged. Scalia wrote that opinion, too, and found that customers representing “four theories of liability and 2 million subscribers located in 16 counties” had been improperly certified as a class by a lower court. In a pair of 5-4 decisions about the workplace, with the five most conservative justices in the majority, the court made it more difficult for workers to sue their employers for alleged harassment or bias. One of those cases involved a black catering worker at Ball State University who said that she had been threatened and taunted by the white woman who oversaw her everyday work. The court held that the university was not liable because the white woman was a coworker, not a supervisor. To be considered a supervisor in discrimination cases, the court said, someone must have the power to fire, demote or discipline the worker. In the drug case, another 5-4 ruling by the conservative majority, the Supreme Court held that makers of generic drugs cannot be held liable for defects if the federal government approved the name-brand version. The ruling overturned a $21 million award that a New Hampshire jury ordered for a woman who took a generic drug for shoulder pain in 2004 and suffered a rare reaction. She was blinded, and the outer layer of her skin burned off over most of her body. In one measure of the strong term for corporations, the Chamber of Commerce was on the winning side for 14 of the 17 cases in which it filed briefs, and a perfect 8-0 in closely divided cases, according to the Constitutional Accountability Center, a liberal group. The center has found that the Chamber is winning much more often than it did 30 years ago. Taken together, the cases heard and decided by the court this term show that business law — specifically, limiting regulation and legal action against companies — is a priority for the chief justice as he leads the court, legal analysts said. Roberts wrote the opinion in a victory for the Royal Dutch Petroleum Co., ruling against Nigerian plaintiffs who wanted to sue in American courts for alleged human rights violations overseas.